Chlorinated polyvinyl chloride (CPVC) is a versatile compound manufactured into many geometries, including sheet, piping and fittings. When produced as sheet, CPVC can is often fabricated for various industrial products, including tanks, scrubbers, ventilation processes and more. The sheet can also be used as a liner and overwrapped with fiber-reinforced plastic (FRP). FRP-lined CPVC utilizes CPVC’s corrosion resistance and relies on the FRP to increase its heat performance and mechanical strength. Take a look at a few examples of how CPVC sheet is fabricated for use across different industrial plants and applications. For information on other industrial applications where CPVC sheet is used, contact Corzan® Industrial Systems to speak to a representative. As the pioneer in chlorinated polyvinyl chloride (CPVC) technology, Corzan® Industrial Systems has proven its value and reliability for use in many types of industrial plants. To learn more about CPVC and its compatibility and uses across six demanding industrial applications, view our latest infographic. If you prefer not to open the PDF infographic, read on for a text-only version. Corzan® chlorinated polyvinyl chloride (CPVC) is an important engineering thermoplastic due to its: High heat distortion temperature. Certified for use up to 200°F (93.3°C). Relatively low material cost. Has successfully replaced and outlasted metals and other costly materials. Inherent chemical resistance. Corrosion-free piping to maintain pressure ratings, flow rates and fluid purity, and to prevent costly repairs. Simple and superior installation. Solvent welding fuses the piping and fitting at the molecular level, maintaining system performance. Fire-related safety advantages. Heat transfer coefficient is approximately 1/300th that of steel, and the material does not sustain burning and requires no flame to install. Certified pressure rating. Pressure rated in accordance with ASTM D2837, having a Hydrostatic Design Basis (HDB) of 4000 psi at 72°F (23°C) and 1000 psi at 180°F (82.2°C). 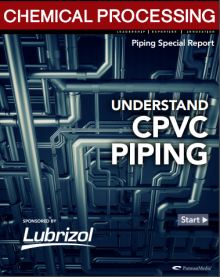 Learn more about CPVC by visiting our resource library, featuring ebooks, white papers, practical tools and more. In mineral processing, it’s common for solids to exist in a piping system fluid stream. However, when rocks, sand, minerals or other inorganic compounds in a slurry rub up against the inside of a pipe, material loss can occur. The risk is greatest at the pipe elbows where momentum changes occur. As a piping system’s wall thickness is worn away, the pipe’s pressure rating and overall mechanical integrity can decrease, potentially leading to pipe leaks or failure. How quickly a piping material wears away is contingent on two things, the fluid flowing through it and its abrasion resistance. Abrasion resistance is the ability of a material to resist material loss when another material is rubbed against it. Due to the molecular makeup of each material, some withstand wear better than others. To reduce abrasion and preserve pipe quality, look to optimize both system conditions and piping materials. Here’s how.